We will definitely come in to visit and I hope someone has another event that will bring us there some day. Loved loved loved my day!! 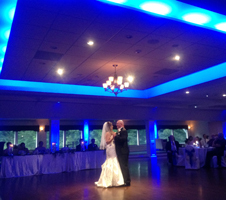 Lisa & Chris (aka Swan & Eagle): Thank you both for the opportunity to host your special day with us here at the Canoe Club Ballroom! It was such a pleasure working with you both (and of course little Logan & Cheyenne!) We loved your little personal touches around the room such as your irish family tree charms on the centerpieces, and your polaroid "selfie station"! We wish you both all the very best! <3, Jillian, Stacy & The CCB Staff!